Like many Japanese customs and traditions, Tanabata festival is thought to have been borrowed from China. More specifically the Chinese Festival Qi Xi, or Kikkoden (乞巧奠) Festival, translated as “The Festival to Plead for Skills”. Kikkoden was inspired by the well-known Chinese folklore story, The Weaver Girl and the Cowherd. This story has many amalgamations, but essentially a princess named Orihime (織姫, or Weaving Princess), worked hard to weave beautiful cloth for his father, Tentei (天帝, or King of the Sky), by the banks of the Milky Way (天の川, Amanogawa, or Heavenly River). But Orihime was sad because she was too busy to go out in search of love, so Tentei arranged for her to meet a cow herder named Hikoboshi (彦星, or Cow Herder Star), who lived on the other side of the river. They fell in love instantly and were married soon after, but they were so consumed with their love that they neglected their duties. Tentei became angry and separated them on opposite ends of the Milky Way. Orihime was so upset about this that Tentei agreed to a compromise, whereby Orihime and Hikoboshi could meet on the seventh day of the seventh lunar month every year, provided they both work hard on their duties the rest of the time. The first time they tried to meet, they found they could not cross the Milky Way to each other because there was no bridge, and Orihime cried to the extent that a flock of magpies came and made a bridge out of their wings for her. It is therefore now said that if it rains during Tanabata, the magpies cannot make their bridge and Orihime and Hikoboshi will be separated until the next year. The Imperial Palace in Kyoto started to celebrate Kikkoden during the Heian period, and it had gained popularity among the masses by the early Edo period. Until this time Kikkoden involved wishing for better skills by writing what they wished to have improved on strips of paper. Girls would normally wish for better sewing skills, and boys for better handwriting. The early Edo period was a time when agriculture was important in Japan, and it is believed that at around the same time Kikkoden was celebrated, farmers and priests of the Shinto faith would pray for their blooming rice crops to remain undamaged by harsh weather. They would pray by offering the produce of the sea and countryside, as well as special cloth woven on a loom called a Tanabata (棚機). Eventually the traditions of Kikkoden and Tanabata merged to become known as Tanabata (七夕), translated as “the seventh evening”. Nowadays Tanabata wishes can be anything, but they are still prayed for by writing the wish on strips of paper, called Tanzaku (短冊). While this particular ritual is done in all Tanabata festivals across the country, the different Tanabata festivals across the country also engage in other, different, traditions. Let us now take a look at some of Japan’s biggest yearly Tanabata festivals. Held from 6th-8th August, the Tanabata Festival in Sendai (located in the North-East of Japan’s largest island, Honshu) is without doubt the biggest and most popular Tanabata festival in Japan, with 2 million people attending over the course of three days. 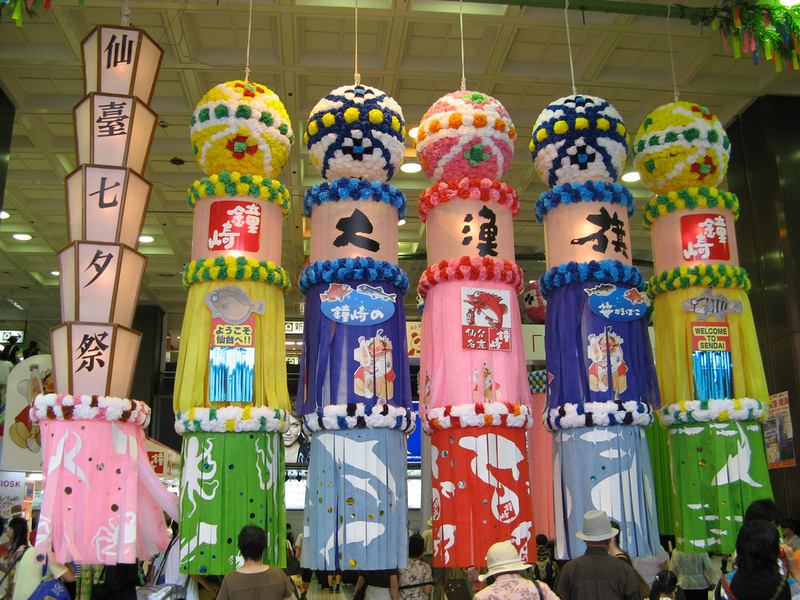 The biggest feature of the Sendai festival is the spectacular Tanabata decorations. Made entirely from washi (和紙) Japanese paper, these decorations consist of a ball or other top feature from which hang 3-5 metre long streamers, representing the thread with which Orihime wove. These decorations hang alongside each other from 10 metre long bamboo sticks, and to walk among them is to feel like you are in a brightly coloured paper forest. Other, smaller paper decorations hang from these poles as well, including kimonos (warding off bad health and accidents, as well as wishing for good sewing skills), cranes (wishing for family safety and longevity), purses (wishing for prosperity), nets (wishing for good fishing and harvests), rubbish bags (wishing for cleanliness and unwastefulness), and, of course, the Tanzaku paper strips. From 7th-10th July every year, this relatively quiet city located 50km South West of Tokyo transforms itself to a city of Tanabata-style festivity, culminating on an enormous parade on the last day. During Tanabata, three of Hiratsuka’s main streets and six of the side streets are closed to make room for the 3000 elaborate decorations, 2000 food stalls and various processions and events. At this festival the making of Tanzaku takes place on the 7th July – the night of Tanabata. The remaining three days are dedicated to a variety of traditional and modern performances, including the Kiyari Matoi (Fireman’s Parade), the Sennin Odori (traditional Japanese dance performed by around 1000 people), and various performances from local school clubs including dance, brass bands and baton twirling. And then there is the annual Miss Orihime Tanabata beauty pageant to round everything up. 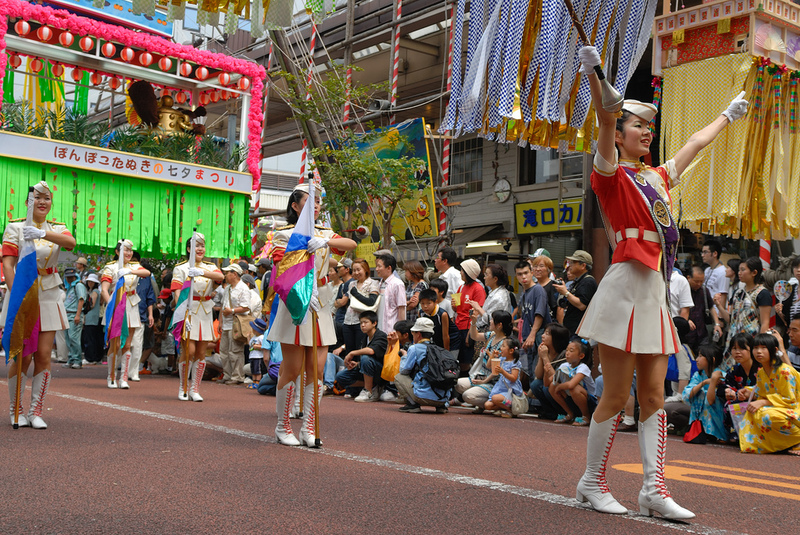 2014 marks the 61st annual Tanabata Festival in Asagaya, which is right in the centre of Tokyo. 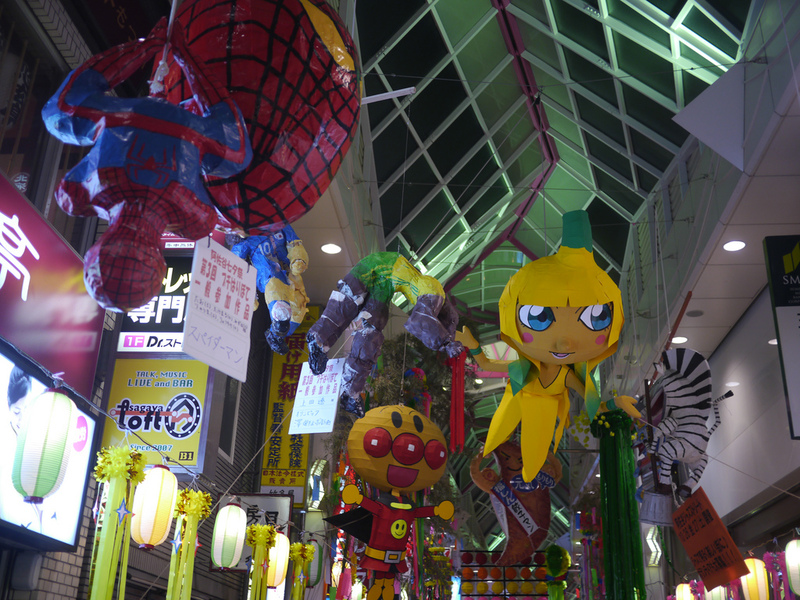 From 6th-10th August the Pearl Centre shopping district will be filled with traditional Tanabata decorations, trees adourned with Tanzaku and stalls and shops serving delicious festival food. However, the most distinguishing feature of this festival by far is the papier mache models. Every year from the ceiling of the Pearl Centre arcade hangs dozens of amazing figures made to look like all sorts of things, from cartoon hearts to animals to popular Disney and anime characters (indeed, Buzz Lightyear has never looked more imposing than when many feet fall and hanging, in a flying pose, directly above small children). Every year there is a contest to see who can make the most impressive models. Previous winners have included a giant mermaid, Spiderman, and an impressively shiny Tyrannasaurus Rex. Who knows what sort of character will win this year? As fantastic and colourful as these Tanabata festivals sound, flying all the way over to Japan to see them is not exactly practical. So instead, why not create some Tanabata magic yourself by making your own Tanzaku or mini Tanabata decoration? Better still, you could bring out the barbecue and make some delicious festival foods, such as takoyaki and yakisoba? Why not let us at Japan Centre know which Tanabata festival you would go to, or what festival food you will be making, by leaving a comment below? Posted in Uncategorized and tagged festival, japan. Bookmark the permalink.